Disclosure: I received a complimentary pass from Charleston Culinary Tours in exchange for writing this review. I hope you all had a great weekend! We basically spent ours eating. Our first stop was Magnolia's for my birthday dinner on Friday and it was one of the best meals we've had in a while. And super Southern... I'm talking boiled peanut hummus, fried mac and cheese, pulled pork and grilled cornbread. Yeah, so good! Add to that a culinary tour in downtown Charleston at almost 9 months pregnant? Sign me up. I'll take any excuse I can to stuff my face with deliciousness before the after-baby diet starts. Ally, Shelby and I decided to make a day of it with our husbands, so we booked the Upper King Street tour through Charleston Culinary Tours which included stops at HoM, Prohibition, 39 Rue de Jean, and Paolo's Gelato. Despite the cold and my sore prego feet, it was so worth it! Our group met our fun tour guide, Charlie, at HoM for the first of our 4 stops. 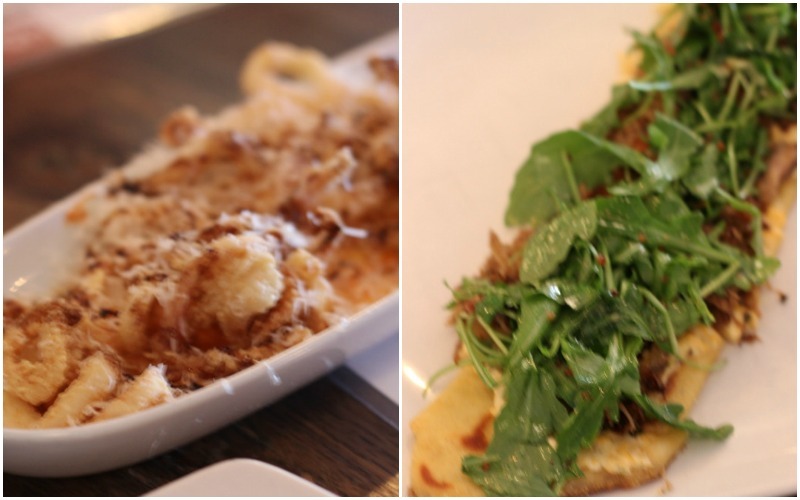 We had three tapas-style courses there which included fried Calamari with parmesan and goat cheese; the Dixie Flatbread (easily my favorite of the day) with pimento cheese, pork confit, carmelized onions, and maple bacon greens; and the Green Gobble'n turkey burger with leeks, spinach and brie. Also I have to warn you, I used my new 50 mm lens (sweet birthday gift from the hubs!) for the first time and sadly there was a bit of a learning curve for me. Thankfully they got better as the day went on! This was my first venture into turkey burger territory and it was so good! I mean... slap some brie on anything and I think I'd be a fan! I would definitely go back to try HoM's other burgers, the Green Hornet with jalapeno-blue pimento cheese sounds delish. Throughout the day Charlie shared information on each of the restaurants, historical information on the culinary influences of Charleston, and mentioned a few of her other favorite places as we walked King Street. We picked up some really interesting info from her that I'll probably pass off as my own knowledge the next time we have visitors. Really looking 9 months pregnant here! Whoa/ew. You have the option of doing the Upper King Street, historic downtown, mixology, or Farmer's Market tour. Each includes a variety of restaurants but luckily we hadn't been to any of them besides Paolo's so it was the perfect afternoon of food and friends. Thank you Paolo's for helping out a pregnant girl and her sweet tooth! Make sure you check out Ally's recap on one of my favorite stops from the day, Prohibition, and Shelby's recap of the delicious and super charming 39 Rue de Jean! Interested in taking a culinary tour? Head on over to Charleston Culinary Tours to find out more! Um, sign me up for this! This looks like an awesome (and delicious) way to spend a Saturday in Charleston. So much fun and thank you so much for the pictures! Oh my gosh now I'm hungry! This looks like so much fun and if I ever get my wish for a Charleston trip, we'll have to add this to our itinerary! Glad you had a good weekend! I had so much fun on this tour, glad you enjoyed it!! What a fun weekend. This is amazing. I'm totally doing this on my next Charleston Trip! Dream life!!! Charleston is one of the most beautiful places in the world, and I'm lucky to live only a few hours away. All the food looks so yummy! By the way, you look absolutley beautiful! This sounds amazing. My kind of day! and you look so good and beautiful! Cannot believe the little man will be here soon, so exciting! What a fun idea!! All of the food looks aaaamazing! Magnolia's sounds like a place I need to visit :) Happy Monday! Yum, yum sounds - sounds so fun!! Nommmm. I wasn't as big of a fan of the turkey burgers but I think it may have had to do with how difficult those wedges were to eat. This was so fun and I'm so glad we ended up on y'alls tour! oh man, can't wait to go on the same tour this weekend! all of that walking makes up for all of the eating, right? ?